Having owned an appraisal firm & holding the highest appraisal designation, I often get asked how can a novice value a house quickly without paying to get it appraised, which can cost several hundreds of dollars, or pestering local real estate agents to run comps for you. 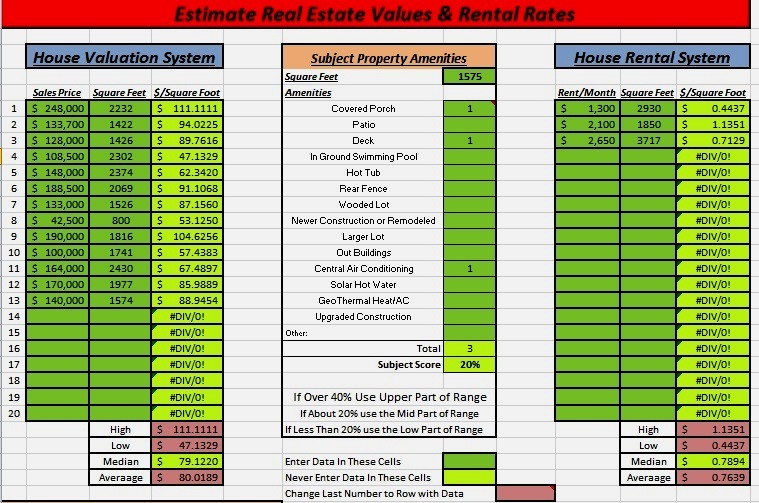 I developed this simple to use system to accurately tell me house values and rental rates by just plugging in a few numbers into an Excel spreadsheet. The raw data is readily available free online for any area in the USA. As an active real estate investor I personally use this system to quickly and easily put realistic values and rental rates on properties that I am considering for purchase. Others have used this system to sell their house, by-owner saving the real estate commission, or with a real estate broker as well as those looking to rent houses or buy houses. This comes with complete instructions so all you do is plug in a few numbers & read the house value and what it should rent for. As a retired Certified General Appraiser, I have found this method of estimating values to be every bit as accurate as the housing appraisals my company used to produce for $500.00 each AND you can use this program over and over again saving the appraisal fee each time. This truly is the purchase that keeps on giving and giving. I use this quick and easy program when figuring out what to pay for an investment house and what it should rent for. This is ideal for real estate investors. In Short, if you need to Quickly, Accurately & Cheaply know the value of a house or the rental amount for a house, this is for you & It’s Cheap! Since I’ve been asked so often for this information, I decided to sell it so everyone can take advantage of this easy to use way of setting property values and rental rates. We sell this and similar useful products on our website too. If you have questions on this please contact us at your convenience. 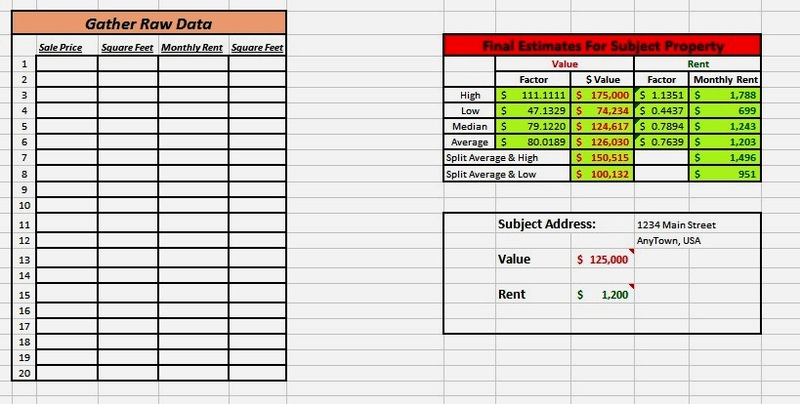 Run this simple Excel program to determine the value of a house and what it should rent for monthly - valid nationwide. To summarize; Easy to use Excel program to foretell your items profit potential before you list. Comes with complete instructions.